I’ve been receiving fixes from Stitch Fix for over two years now. If you aren't familiar with Stitch Fix, it's a styling service where a personl stylist uses your notes, Pinterest boards and answers from a questionnaire to send you five items picked specifically for you! I don’t get a fix every month and not always every other month depending on how our finances are looking. In fact, I just moved my next Fix out another month due to our current budget. As I was writing my January Stitch Fix review and doing my laundry, I thought about how there are some pieces I’ve received from Stitch Fix that pretty much changed my life. Okay, that was dramatic. Maybe not changed my life, but were pieces that I use all the time, sometimes even wore out! 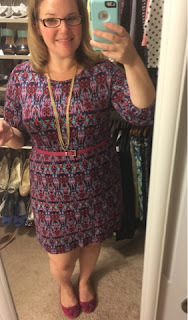 Here are my top 5 life-changing items from Stitch Fix, in no particular order. I received this dress in my Alaska fix. I asked for some dresses that I could wear on our Alaskan cruise. I’ll admit I was thinking more along the lines of fancy cocktail dress that I could wear on a cruise, but my stylist sent me this one to pair with an anorak jacket that I requested. When I tried it on, it was cute, but not my favorite. But it was super comfortable, so I decided to keep it. I was playing around one day and belted it. Holy moly. It was like a whole new dress! This dress has been in constant rotation ever since! I’ve paired it with belts, long cardigans, heels, flats, booties. You name it. I almost didn’t buy it and it’s been one of my all-time favorite pieces! This necklace came in one of my 5/5 boxes. I immediately knew that I would get a lot of wear out of it because it’s long and gold. At one point in my life, I was a silver girl. I’m now firmly in the gold camp! This necklace is perfect. It’s light and long so I can dress up t-shirts with it. I really like to pair it with a top and cardigan or with sweaters. I swear I wear it at least once a week, normally multiple times! It should be no surprise that at least one cardigan is on here (just kidding, there’s two!). I received this in a fix a year ago. This type of cardigan was in style and I thought it would be fun to try. A year later, I still love it! It’s so warm and I love the draping in the front. This is one of my favorite Friday outfits! My second cardigan on the list! 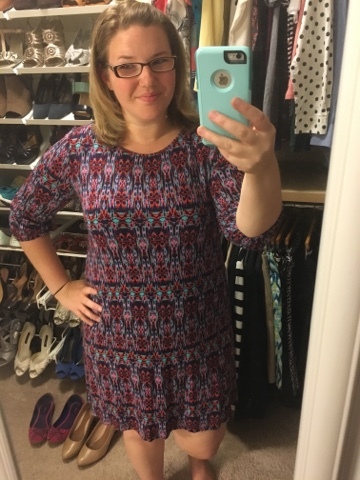 This was one of the first items I received from Stitch Fix and it’s still one of my favorites! When I bought it, it didn’t zip up all the way. Now it does, but it’s not very flattering. I’ve always worn it open and it was fine. I think it actually looks better that way! I wore it to meet my favorite person ever - The Pioneer Woman! Also, the blue bag is the next item! My favorite part of this cardi is that it feels like a sweatshirt. It’s so cozy! This is actually the blue bag in the photo above! I had to search to find the title of this one! I don’t usually keep the style cards for the accessories that I receive and it was one of the first items I received, so it took some time on Pinterest to find it! But I did! This purse ruined me for other Stitch Fix purses. I received a clutch from Stitch Fix and love it equally, but haven’t had as many chances to wear it. I used this purse every day for at least a year, maybe more. I only stopped wearing it because some of the blue started coming off and the handles were starting to separate from the bag. Pretty much, I wore it out. I’ve yet to find a bag from Stitch Fix that I love as much. The color is gorgeous and the inside is luxurious. Worth every penny that I paid (however much that was!). I wonder if they can just send me another one? 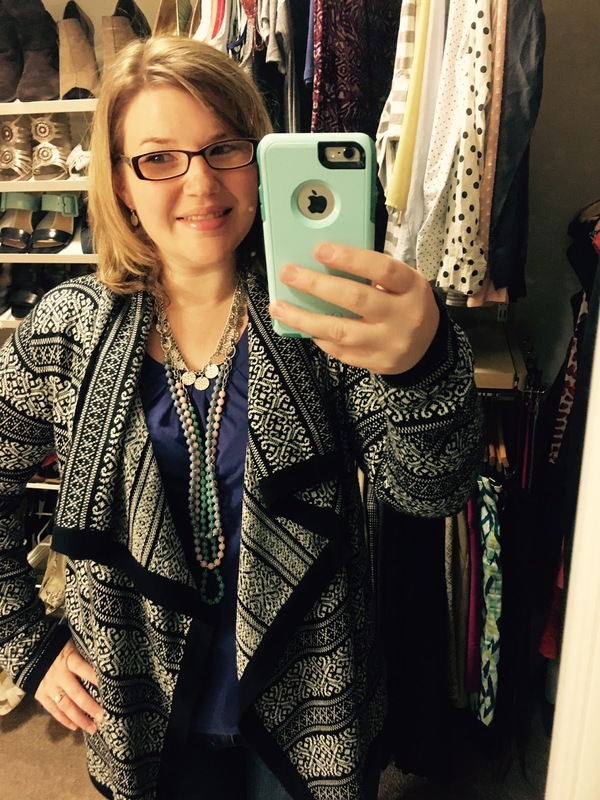 If you're interested in trying Stitch Fix, you can use my referral link. It's a $20 styling fee that can be applied to whichever items you decide to purchase, the others you send back in a prepaid shipping envelope! My thoughts on these items are my own opinions. I don't get paid by Stitch Fix, I just really love them and get a credit if you use my referral link. What are some of your favorite Stitch Fix items?